What river cruise did you embark on? Kathy: We were on an AmaWaterways river cruise down the Danube. We started in Budapest and exited in Vilshofen, Germany. Then we bussed to Munich for a three-day extension with AmaWaterways. We added it to our cruise package, and an AmaWaterways guide was there for the whole thing. Was this your first river cruise? Kathy: Yes! We had been on Caribbean cruises before, but those were getting rather old. Viking cruises advertises extensively, and the ads looked so appealing to us — so we reached out to Jane at Southern Travel Agency, who we’d worked with before. Jane gave us travel materials and information for four different river cruise lines, and we decided to go with AmaWaterways. So what made you decide on AmaWaterways? Kathy: One reason we chose AmaWaterways was because their reputation was unquestioned. 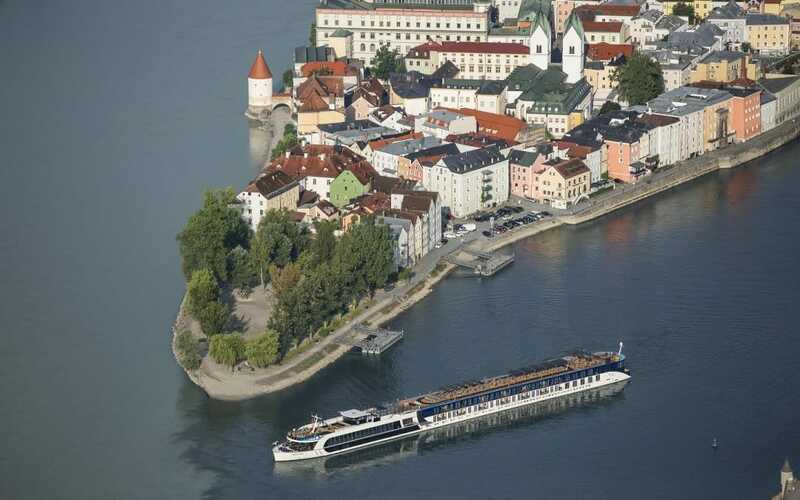 The AmaWaterways cruise line is known for high standards. We knew it was going to be an expensive trip — but you get your money’s worth. The Danube river ship we were on was also pretty new — called the AmaSonata — and it was just lovely. On board, the staff treated us so well. There were about 50 staff and only about 180 passengers — you have a lot of people taking care of you, and you really feel that. Steve: And we appreciated their attention to detail. I have an allergy to shellfish, which we noted before the trip. The cruise staff took care to ensure I wasn’t exposed to any type of shellfish, and that was very impressive to me. And all of the food was just excellent; there was always a wide variety, something different for you to choose from at each meal. What else did you enjoy about river cruising with AmaWaterways? Kathy: We enjoyed the local wines and beers every day. AmaWaterways staff changed our menu depending upon which country we were in, so we can experience local cuisine. You can make a connection between the land you were seeing and the people you met with the food you were eating. How does river cruising compare to your experience with ocean cruising? Steve: There really isn’t much comparison. We thought river cruising was much more enjoyable than any ocean cruise. Think about the number of people alone — we were with a couple of hundred passengers, compared to thousands on an ocean cruise. The AmaWaterways Danube river cruise surpassed expectations quite a bit. In the future, we probably won’t go on another ocean cruise — but we do want to river cruise again. What was your favorite part of the Danube river cruise? Kathy: I’d say the highlight of the entire experience was one of the excursions, up into the Bavarian Alps into the Austrian lake districts. There were five lakes nestled into the Alps amongst two small villages. We spent the afternoon touring villages and driving from lake to lake to lake. We didn’t realize how beautiful the Alps and Bavarian countryside was. It was nice to see the gorgeous scenery as you cruise down the river, but you get to go off the ship and explore as well — you get the best of both worlds. What was it like working with Southern Travel Agency to plan your cruise vacation? Steve: We’d worked with Jane before to arrange all the travel details of a previous trip — so we had confidence in her. All the arrangements for the river cruise were made through her. Prior to departing, we met with her in person and she went over the trip step by step and helped us with all the paperwork. We had confidence she’d put together a luxury cruise itinerary we’d enjoy — and she did. And finally — where do you want to travel next? Kathy: We’d definitely like to go back and do another river cruise. Though we went to Rome a few years ago, and we’d like to see more of the Italian countryside. So we’ll do a rural Italy trip, and then go back for a river cruise! Want to read more about river cruising? Read about our clients’ Gordon and Carol’s river cruise through breathtaking Eastern Europe. Ready to find the best river cruise for you? Our Southern Travel team would be delighted to help! Just get in touch with a few details about your trip by clicking the blue button below and our experienced travel agents connect for a complimentary planning call.